For years, customers and distributors have asked Bittermens if we would ever release iconic flavors that have been made popular by other brands. From day one, we’ve always said that we won’t simply copy other flavors in the market, nor make replicas of historical flavors. However, if we had a unique perspective and could create something truly useful, that’s a different story. In 2011, we launched the Orange Cream Citrate as an experimental flavor. Instead of going for a more bitter and spice driven flavor profile like most orange bitters that were on the market, we went with a fresh, summery expression of orange. It solved a whole set of problems that bartenders didn’t even know they had. Behind Orange, the most requested flavor was an old fashioned aromatic bitters – and we resisted. There was no reason to clone something that was already being done well and at a fair price. With that being said, the idea of making a truly useful aromatic blend that was evocative of the Venezuelan (now Trinidadian) classic, stuck in our minds. Then came a flurry of candy-color red New Orleans/Creole style bitters and people started asking us if we were going to make one ourselves. Again, we deferred, saying that we had no need to replicate something that was already being done well and at a fair price. Then it hit us. Could we create new classic aromatic bitters that unified the great bitters traditions – not just cocktail bitters but bitter liqueur flavor profiles as well? What’s the flavor profile? Extremely complex, but not in a confusing way. It’s a little sweet, nicely bitter and surprisingly fruity. 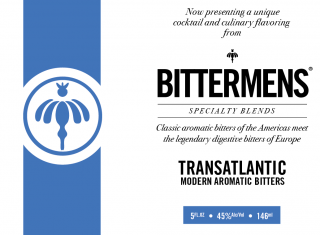 We’ve merged the great bitters of the world to create an aromatic bitter that is useful in such a wide array of drinks. In total, sixteen botanicals make up this unique aromatic offering. Unlike the major brands, we are not adding in caramel color or any colorants at all (so it’s a golden color). Nor are we adding in any sugar. The sweetness in ours only comes from the licorice root. It’s certified kosher and GMO free.